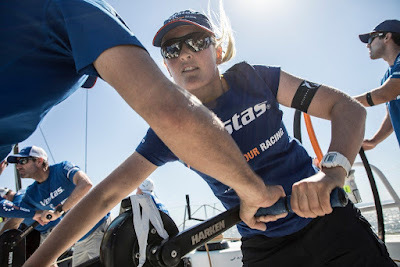 Last Sunday, under sunny skies and a building sea breeze, Vestas 11th Hour Racing started the eighth leg of the Volvo Ocean Race from Itajaí, Brazil to Newport, RI, USA with all 6 of the other Volvo Ocean 65s. The 5,100 nautical mile leg is expected to take them through multiple challenging areas of the Atlantic Ocean and last around 16 days. After 5 days at sea, the blue boat is just behind Turn the Tide on Plastic in the lead. With the tracker now expected to stay live for the entire leg, and the fleet looking to spend the next 10 days on starboard tack, fans can now watch the drag race unfold live on volvooceanrace.com or via the Volvo Ocean Race app.